The weather forecast was brilliant and a few recently joined members advised they were attending their first Buick Club run so we were looking forward to meeting them and their Buicks. We left home at 6.50am and there were more cyclists on the road than usual so there must have been a big event we summized. Thanks Geraldine and Greg for organising this run. This meeting point you arrange when we go south is my favourite spot for a quick coffee and morning tea. It’s the Gelato Emporium in the Southern Gateway Centre. You might say 8am is a bit too early for gelato but as I make my own I was able to buy their hazelnut ingredients to try for my next batch. The view over Bulli and the coast line is spectacular from this place and great to bring visitors to. We should have called it “Meet the New Member’s Day” because we had many attend or visit briefly. Darren, Erlaine Purkis and Co – visited us without their new 39 Buick and it was good to see another local, Paul Unicomb. Francois & Francine and Annmarie Adams joined us in a modern. The Russell’s brought their new ride, a RHD 1980 Park Avenue but they kept it quiet so when we got back to the car park everyone was wondering who this Buick belonged to until Jim & Virginia owned up that they had just bought it. At last, they have a Buick with leg room to fit their tall frames. “Not So Squeezy” 🙂 Their other Buick is a compact 77 Skyhawk. The Massey’s brought their 68 Riviera, the Gronaus came in their 72 Riviera and brought some German visitors with them, Castles were in their 50 Convertible. 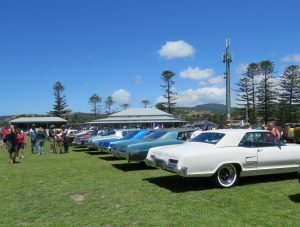 At 8.45am it was time to make our way south to the Kiama Showgrounds so we headed south in convoy. Local members Peter Thomas with his 65 Skylark convertible (and red Rambler) and Colin & Anne Booth in their 64 Skylark were there minding our car spots. We ended up with 10 Buicks on display along with hundreds of other classic cars on a beautiful grassed area sandwiched between the headland and the ocean. What a gorgeous place to spend the day. Rotary Club were cooking burgers and steak sandwiches for our lunch and we set up Camp Buick in the shade of some tall pine trees at the northern end of the showgrounds. It worked for quite a while but in the afternoon the shade went away. Luckily there was a cool breeze keeping us quite cool. The Australian Navy had one of their Squirrel Helicopters on display, there was an area set aside for radio controlled model cars doing huge jumps and churning up the grass and there was a guy with a jet powered miniature dragster and go cart disturbing the peace! I had some rear wheel bearing seals issues recently since having the bearings and seals replaced on the 65 Riviera. Couldn’t work out why oil was seeping out on both sides after a long highway run. Thought it might be a blocked breather but not so. Took it back to have the seals looked at with replacements on hand and it turns out he had put the seals in backwards. Hard to believe but true. He said he was sure the old ones were in the same way but I don’t think so. The first shake-down run to Chromefest a couple of weeks ago and one side seeped a bit again but I was hoping that was just residual oil trapped in the bearing etc. I was looking forward to this second-shake down run to confirm it is fixed before replacing the brake shoes and it was a good result. Another box ticked, always a good feeling. What a great day in every way! Look forward to next time.